Hessah Alajaji took to the road on Saturday night in Riyadh, Saudi Arabia, hours before the driving was ban officially lifted. 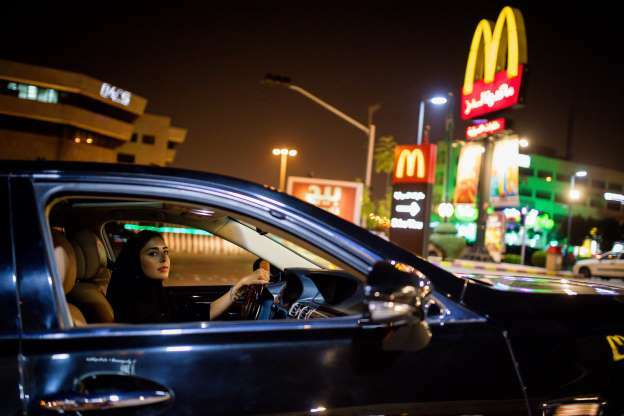 While Saudi Arabia counted down the hours until midnight for the ban on women driving to be lifted, Hessah Alajaji ran out of patience. She put on some lipstick, jumped in the driver’s seat of her parents’ Lexus, and at 9:10 p.m. drove out for dinner. “I’m a bit naughty,” she said, laughing over the melody of Saudi pop tunes as she cruised the wide highway linking north and south Riyadh, the Saudi capital. “I’m just so excited. Ms. Alajaji, 33, was one of an elite group of female drivers who succeeded in getting their driver’s licenses in time to mark this historic day, one that erases her homeland’s dubious distinction as the last nation in the world in which women could not drive. Ms. Alajaji learned how to drive in Los Angeles, where she regularly commuted as she earned her master’s degree. For Ms. Alajaji, who lived in Los Angeles while getting her master’s degree in fine arts, the chance to drive at home was a moment to savor. On Saturday night, she felt the weight of history on her side. And she also felt hungry. Finally, she could do something so normal that women across the world take it for granted: She could get a meal on her own. She didn’t need to get her father or brother to take her out as required by the kingdom’s strict guardianship laws. She didn’t need to order her family’s male driver from his evening repose. The country’s ruler has decreed that women don’t need their guardian’s approval to get their licenses. All she needed to do was pull on her abaya, the long modest cloak that Saudi women wear in public, cover her hair and hit the road. “It’s so normal for me and so strange all at the same time,” she said, as she reversed out her driveway at home. Ms. Alajaji learned to drive in L.A., where she made a 45-minute one-way commute every morning to her campus at Claremont Graduate University in her convertible Mercedes. 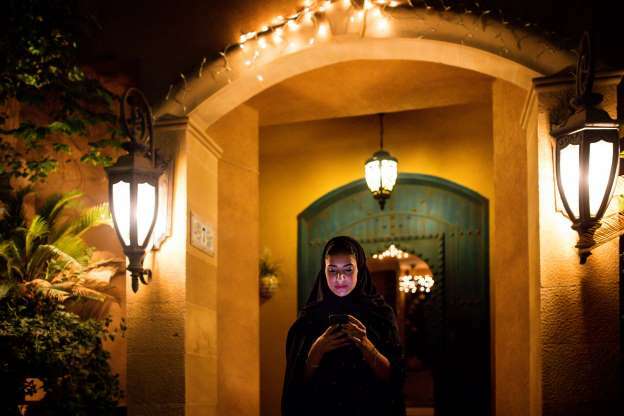 In Riyadh, her ride was a bit more sedate — her father’s two-year-old Lexus. Her first destination was a bit more banal: the McDonald’s a five-minute drive from her front door. She was so comfortable in the driver’s seat that it was never a question how she was going to place an order — she went straight to the drive-through. The disembodied male voice taking her order didn’t pause when a female voice placed her order. The male workers at the next window, both Filipinos, smiled broadly when she handed over her money to pay. A Saudi man waiting in his Toyota Corolla behind Ms. Alajaji started waving out his window when he realized it was a woman’s arm who reached out of the Lexus to pay. Ms. Alajaji, grinning, waved back and then pulled back onto the city streets. Next on her errand list: a trip to the gas station. Moving smoothly through traffic, she explained how she managed to become one of the first Saudi women with a license. For those with valid driver’s permits from overseas, the Saudi government allowed a straightforward path to a new national permit. These women took a quick eye test and blood test, and they could exchange their international license for a Saudi one. For Ms. Alajaji, however, she had to take a brief refresher course in driver’s ed because her American license had expired. She sat through a six-hour tutorial with beginners learning the basics of road safety. “I knew it all already, but it wasn’t a waste of time. I needed to do it because I needed to drive on the 24th,” she said, referring to the day the ban was to be lifted. On Saturday night, Ms. Alajaji looked like a veteran American commuter as she changed lanes, sipped from a bottle of water and switched radio stations. At the intersection before the gas station, however, she tensed up. A police cruiser was parked, its lights flashing, at the corner she needed to turn at. At this point it was only 9:45 p.m. Still two hours to go until driving day. But the anxiety was misplaced. The policeman had already pulled over another driver — a man. Ms. Alajaji was one of a group of female drivers who succeeded in getting their driver’s licenses before Saudi Arabia’s ban officially ended. When Ms. Alajaji pulled up to the pump at the gas station, her muscle memory guided her to the correct side of the car where the gas tank was located. She uses the Lexus almost every day, but normally it’s her driver in the front seat while she sits in the back. Her memory failed her, though, when the gas station attendant asked kind of gas the car takes, prompting a phone call to the family driver who was home watching television. “Ali, do we need 91 or 95?” she asked him, referring to the two different octane ratings of unleaded gas sold in the kingdom. The answer came with a chuckle — 91. As the attendant filled her tank, Ms. Alajaji started noticing the stares from outside her car. A small group of men kept doing double takes as they passed by, the unusual sight prompting smiles and some more waves. Two men in a white Nissan Pathfinder shouted encouragement. “You are the pride of all of us,” they yelled. Ms. Alajaji reveled in the celebratory atmosphere. “I hoped I would experience this one day. But I never thought it would happen in my lifetime,” she said. With her tank full and the music on, she pulled back into the street, eager for morning when she would drive herself to work at the Ministry of Health.